These shops won't be a reason staffers can't make it to the polls. PR firms across the country are making sure employees have ample time to get to the polls on Tuesday. Some gave staffers the day off, while others threw parties or gave treats to employees who voted. Here’s what five PR agencies did to mark Election Day. Allison+Partners signed the Time to Vote pledge to encourage employees to take time out of their workdays to vote in the midterm elections. In accordance with this pledge, and continuing an initiative the firm started in 2016, all staffers, including interns, in Allison+Partners’ U.S. offices have been provided with up to four hours paid time off to vote. The firm is also offering a day for early dismissal, should it reach a percentage goal for its offices across the country. Offices are also hosting celebrations to encourage voting and meeting the participation threshold. For example, the firm’s New York office held a "Beer and Ballots" party on Friday to give employees time to review the issues, go over their ballots, and see where candidates stand in preparation for voting. The firm also has a mock "bake sale" going on for those who voted to pick up some sweet treats. Praytell wanted to follow the lead of client Blue Point Brewing and give its staffers the day off so they could have time and space to make their voices heard. "Nearly 60% of non-voters cite work or school as a reason for not making a trip to the polls, so we wanted to remove any barrier possible for this crucial election," said Praytell CEO Andy Pray. 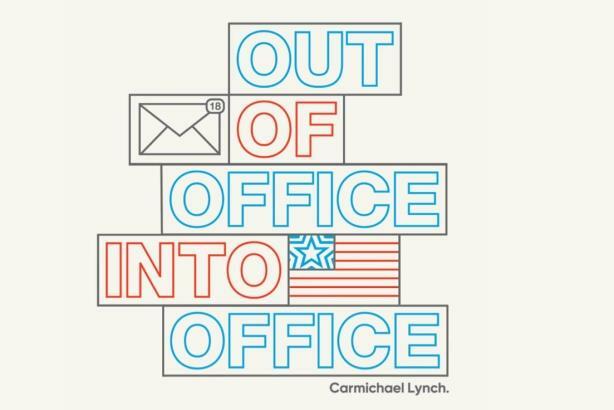 Because time off work is the biggest reason people do not vote, Carmichael Lynch Relate gave employees a half-day off for its "Out of Office/Into Office" campaign. This is what it looked like when people visited carmichaellynchrelate.com and carmichaellynch.com this morning. "Rather than forcing our folks to choose between work, life, and civic duty, or fretting over the time they’re spending, we decided to provide company-wide paid time off to make sure the voices of our 300 employees are heard," Carmichael Lynch CEO Marcus Fischer wrote in a blog post. "We’re calling it our ‘Out of Office/Into Office’ initiative."